Although it may not feel like it, Summer is fast approaching. Now that Spring is under way, we have some fab launches here at Scentstore. Many of which are limited editions, great for Summer or holidays. Back by popular demand, these are a holiday must have and a cute ‘His n Hers’ – The difference in (most) Summer limited editions is that they contain a lower amount of alcohol, making it much safer to use in the Sun (when we see it!). The bottles match in different colours, with the idea behind it being a beautiful Sunset/Sunrise and they come with a dramatically less price tag – paying just £41 for the larger size. Ladies, the notes for this one open with top notes of lychee and grapefruit; heart notes of pitahaya, guava and passionfruit whilst the dry down base lingers with notes of vanilla and woods. Gents, the notes for this one open with top notes of coriander, kiwi and grapefruit; heart notes of nutmeg and fresh pineapple whilst the dry down base lingers with notes of cypress and vetiver. Inspired by icons Betty Boop and Popeye, these limited editions smell as good as they look with the icons printed on the bottles. Ladies, the notes for this one open with lemon sorbet, ginger and sugar cane; heart notes of exotic tiara, jasmine, orange blossom with the base containing vanilla, musk and neo-labdanum. Gents, the notes for this one open with neroli, mint and aldehydes; heart notes of sage, clary sage, woody notes, ambroxan with the base containing vanilla, tonka bean and sandalwood. Subtly playing on the brightness of Paul Smith’s stripes, this year sunshine editions come in a frosted class with ombre colours to suit. Ladies, this one is a citrus delight opening withnotes of grapefruit and bergamot, fading into a floral heart, and a woody, musky base. Gents, this one is a spicy oriental scent opening with notes of notes are grapefruit and coriander leaf; middle notes of nutmeg and black pepper and warming down to a base of anise and cedar. The perfect companions, Invictus and Olympea now come in a limited edition Aqua edition. Frosted bottles give a cool vibe, great for summer or daywear. Ladies, Olympea opens with notes of Calabrian bergamot, ginger lily and petit grain leaf; heart notes of salty vanilla and drying down to a base of cashmere wood and ambergris, with fabulous longevity. A warm scent with a citrus burst. Gents, although Invictus is a fairly fresh scent, this is fresher opening with a top note of marine accord; heart notes of violet leaves, yuzu and pink pepper whilst the dry down enhances longevity with notes of guaiac wood and ambergris. 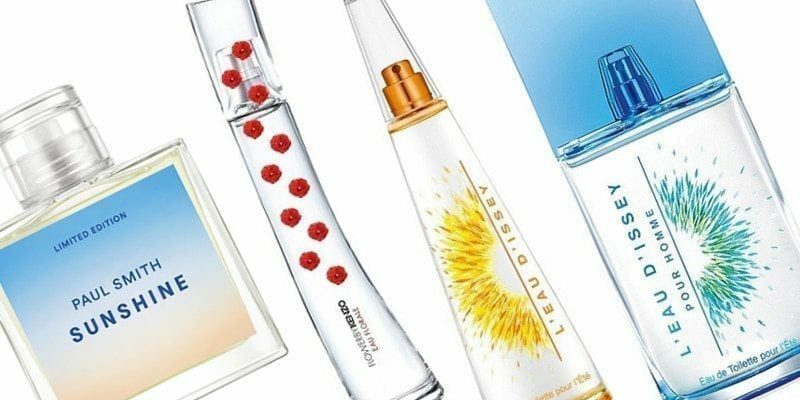 FlowerbyKenzo Eau Florale is limited edition citrus version of FlowerbyKenzo opening with notes of pink grapefruit and mandarin orange; heart notes of bulgarian rose and white peony whilst the dry down has more depth with base notes of vanilla and white musk. It comes with a cute little red clutch too!